Is that a full SLR camera kit in your pocket or are you just happy to see me? Back in the early 80's I was just getting into photography having progressed from my first, childish, 110 instamatic camera to my first 35mm SLR, a Zenit EM. I loved that Zenit as it was my first 'real' camera but one thing was for sure; it sure was heavy and clunky. I didn't have a ever-ready case for it, just a neck strap. Slung over one shoulder, if you ran and that big old SLR swung around unchecked and hit your side you knew about it. I remember looking in a camera shop window at that time and seeing a Pentax auto 110 thinking it was the ideal camera - if only it weren't so darn expensive. In many ways it was perfect; perfectly portable at least. You can easily carry the camera with one lens mounted and a couple of more primes in a single pocket. The Auto 110 was one of only a handful of serious cameras made for what was consumer orientated, simple format. Consider that most 110 cameras were like my first instamatic; they had one aperture and a single shutter speed - the only exposure control you had as the ASA film speed you chose to shoot with and everything else was left to exposure latitude. The film format is tiny (a quarter of 35mm) and the films of the day weren't up to that kind of abuse. 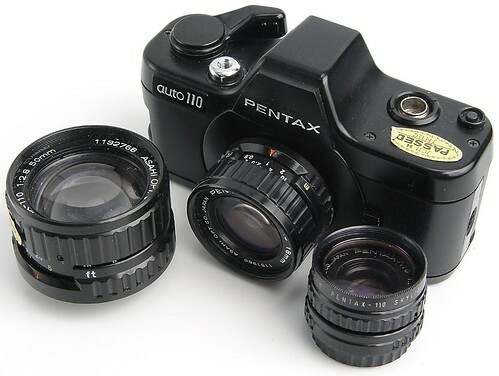 And yet, as the 110 format was dying Pentax inexplicably launched the Auto 110 - the most competent 110 camera ever. The only 110 camera with interchangeable lenses and TTL metering. The only 110 camera that looked like a real SLR. It had one of the most advanced exposure systems available in any 110 camera. It might not be the smallest SLR commercially released (I believe that honor goes to a Russian camera) but it is certainly the smallest true SLR commercially available in the west. The novelty isn't only skin deep. The auto 110's exposure system is very uncommon. The lenses contain no aperture mechanism of their own. The aperture mechanism and shutter are one unit with one set of square blades to do the work of both. What happens is the mechanism is stopped open until you press the shutter. Before you press the shutter the light is prevented from hitting the film by the SLR's mirror not the shutter. When the shutter is tripped the shutter/aperture blades close before the mirror lifts out of the way. The blades open to the appropriate aperture for the appropriate amount of time before closing again. after the film has been exposed the mirror drops back into place and the aperture/shutter blades open back up again. This exposure mechanism dictates that all lenses must have the same speed (in this case f2.8). Also, in order to scale back on the complexity of this mechanism somewhat, the user does not have any control on the aperture or shutter speed - that is all left up to the Auto 110's electronics. It fact, the viewfinder doesn't even tell you what settings have been chosen; if the light in the viewfinder is green the exposure is fine, if it's yellow, the exposure will be less than 1/30th. It looks like a toy and feels like one too. The camera body and the lens bodies to a great extent are plastic making it the lightest SLR ever. Picking it up, however, immediately lets you know that this is a real camera. Putting it up to your eye the focusing is bright and snappy and the whole camera is not too fiddly to operate considering its tiny proportions. The shutter release is very predictable and threaded for a cable release. The film advance is a double stroke mechanism (single stoke came later in the Super). And that's about all you need to know to operate the auto 110. I bought this camera from CraigsList for $50 in 2004; due to the difficulties involved with obtaining and processing film and the availability of tiny digital cameras now this is about its current market value. Many Auto 110s were sold in a kit form and I believe I have what was packaged as the "Major Component Set". This is made up of the camera and standard lens (24mm), a wide angle (18mm) and telephoto (50mm). In 35mm terms these lese are equivalent to 35mm, 50mm and 100mm. It also came with a winder, flash, case and hand strap. All lenses came with caps and my set came with skylight filters on all lenses too (something not part of this standard kit). The only thing broken on my kit is the battery door for the winder which is a common problem but,as the winder seems to double the size of the camera when fitted, not having the winder is no great loss. Apart from that everything seems to work fine and, although I bought the camera as a novelty and not as a user, after playing with it and learning its place in camera history I do intend to buy some film and shooting with it for fun. The idea of carrying a whole SLR kit in my pocket is too good an opportunity to pass up. Thanks for the link to the pentax110 page. I will be posting a links area soon so I'll include a link here. I noticed you are a winder cover short, send me your address and I'll send you a freebie. I found your information of great help. I have a Pentax auto 110 with instructions, lenses,winder,flash , carry bag and clip which I was considering selling but it might be a collectors item to pass on. Just wanted to let folks know that eBay is an excellent source for large quantities of cheap 110 film. I just bought 50 rolls of Fuji 200 asa, expired in 2003 but kept in cold storage. The film is excellent and I paid $12.99 + $6.99 for shipping for the whole lot! Thanks for the memory! I used one for many happy years in UK. i have a used pentax auto 110, still in excellent condition with the 110 winder and AF130P flash; plus the three lenses - 18,24 and 50mmF2.8. If anyone is interested i am looking to sell this item.